Pyrgos is one of the most famous traditional villages among tourists. Located in the middle of the island on the top of the hill, it’s overlooking half of the island providing great views and a different sunset. You will pass through Pyrgos going to Prophet Elijah Mountain (Profitis Ilias), yet is’s in a walking distance from a famous winery Santo Wines. You will know you are entering the borders of Pyrgos been greeted by a beautiful windmill on your right and several restaurants. Right from the round square you have a view of the village spreading upwards. You may have your gastronomic or local coffee experience right on the square under the shady trees or inside a restaurant with traditional décor inside. For those who love to explore the whole place first, the trip starts here too. A little path will take you to Castelli – the remnants of the Venetian Castle located on the very top of the hill. Walking up the steep steps make sure you wear proper shoes with no high heels. The tiny houses, souvenir shops and little taverns are set as amphitheater provoking the visitor all the way with passages, churches and little wavy lanes. Step by step you’ll arrive to the very top. That’s another impressive experience of finding several churches together with a little museum of icons and relics in St. George church and a nice coffee shop for some rest. The views from here are very rewarding and there are things to explore! The village can boast of a good number of churches and traditional Cycladic architecture while a sunset from here is also very promising and away from the crowds. Use a chance to take pictures with a different setting! We invite you to Pyrgos not only to feel the atmosphere of a traditional village, but also to have an amazing gourmet experience or even professional cooking classes with a great introduction to the conditions of specific plants’ growing in Santorini. This is going to be your adventurous visit into the local flavours and yet you’ll get an amazing knowledge of traditional products of our island. 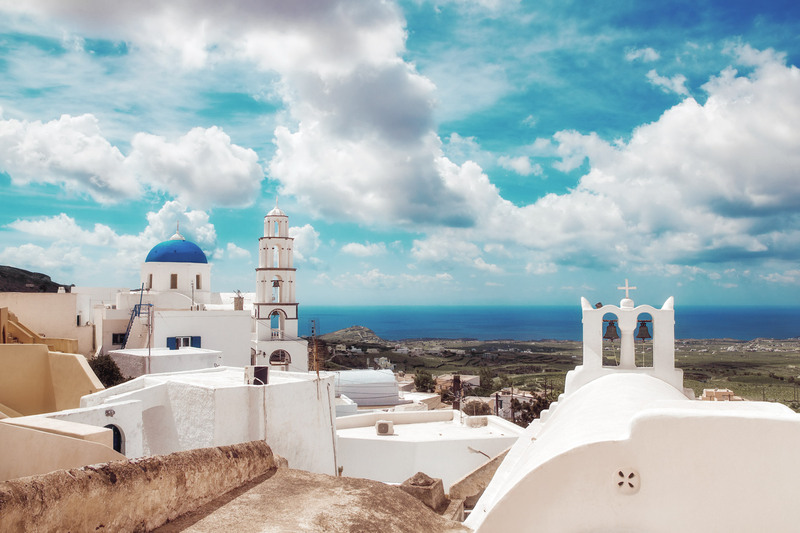 Pyrgos is also a place to visit Santorini of the Past exposition seeing the way of life in previous decades and ways of production of traditional cherry tomato paste and wines. We recommend avoiding midday hours for a visit to Pyrgos in summer or to have hats and umbrellas with you. You can also use these hours for your meal, cooking classes or a visit of the exposition.